A multi-ingredient formulation, Greeniche Hair, Skin, & Nails Formula is packed with all the essential nutrients that support the health of your hair, skin, & nails. Healthy hair, skin, & nails are vital components of overall well-being. However, these are constantly affected by environmental facts as well as dietary habits. It is sometimes not practical to keep track of diet to ensure consumption of all important nutritional substances, and at the same time, we cannot always avoid exposure to outside factors. This calls for a supplement that can help support healthy hair, skin, & nails. Greeniche Hair, Skin, & Nails Formula is packed with all the essential nutrients like Vitamins, Minerals, Omega etc., to provide your hair, skin, & nails the nourishment they need. Greeniche Hair, Skin, & Nail Formula can be consumed regardless of dietary restrictions as it conforms to all Greeniche standards and commitment to fulfill the needs of Canada’s multicultural community. Dicalcium Phosphate Dihydrate, Hydroxypropyl Methylcellulose, Magnesium Stearate, Microcrystalline Cellulose Powder. Helps support healthy hair, skin, & nails. Some people may experience mild gastrointestinal bloating, constipation, and indigestion. Hypersensitivity, such as an allergy may occur in rare cases. If that happens, discontinue use. 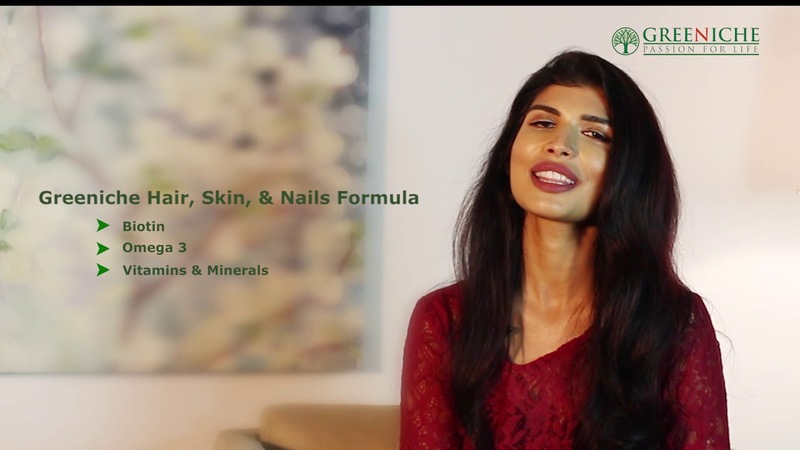 Hair, Skin & Nails Formula (Skin Care). A friend recommended me these supplements and it worked dramatically for me.